New Year’s celebrations will be in full swing in Taiwan this year, with exciting events taking place throughout the entire country. From dazzling firework shows to a chartered flight at dawn, there are many different activities to welcome 2019 in Taiwan. Firework celebrations will illuminate the night sky across the entire country on New Year’s Eve. 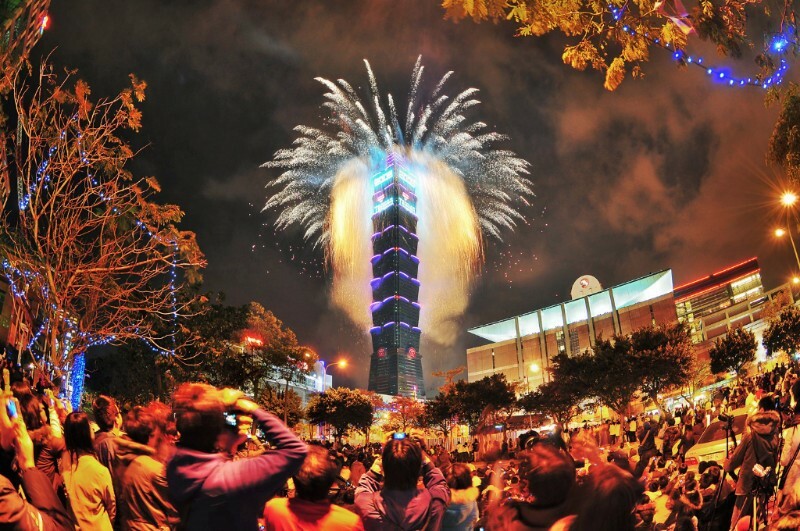 Kaohsiung, Keelung, Taipei, and other cities throughout Taiwan all boast incredible firework productions that draw visitors from all around the world to witness the spectacle. This year, fireworks launched from Taipei’s iconic Taipei 101 tower will last an unprecedented six minutes long as over 1 million onlookers ring in 2019 from the capital city. After the fireworks show in Taipei, concerts by high-profile artists will take place as the celebration of 2019 continues into the morning. In Taimali, Taitung County, the annual New Year’s Day Bikini Beach Run is another unique way visitors and locals greet the New Year. Participants gather on the sandy shores of Taimali in the early morning hours as an indigenous dance performance kicks off the celebration before the running event. Runners of all abilities are welcome to participate in the fun run on the beach and enjoy the indigenous performances at the event, which is put on by The Council of Indigenous Peoples, The National Taitung Living Art Center and the Taitung County Government. Taiwan offers a number of magical events that take place at dawn on New Year’s Day. There are many beautiful places to witness the first sunrise of 2019 throughout Taiwan — favorites are on the coast or up high in the mountains. In Taiwan’s eastern cities, the sun rises over the Pacific Ocean, and visitors and locals alike like to watch the first sunrise of 2019 at Qixingtan Beach in Hualien, or at Fulong Beach near Taipei. This year, the tour operator, MyTaiwanTour, is offering the ultimate way to see the first dawn of the New Year at 25,000-feet in a chartered China Airlines airplane. The flight takes off before dawn in Taipei and slowly follows the rising sun over the Pacific Ocean before touching down in Taitung, where a delicious local breakfast awaits.